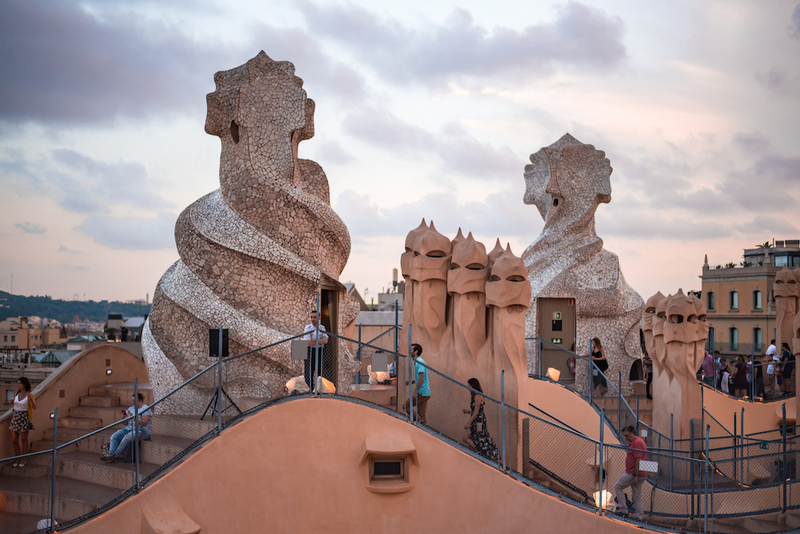 The “Jazz Nights at La Pedrera” are the perfect way to kick off a night out in Barcelona. 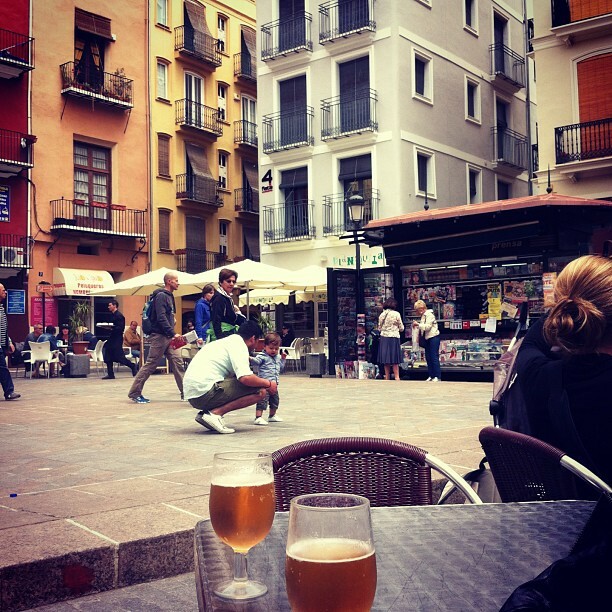 Words & photos by your rooftop rambling guide, Ben Holbrook. 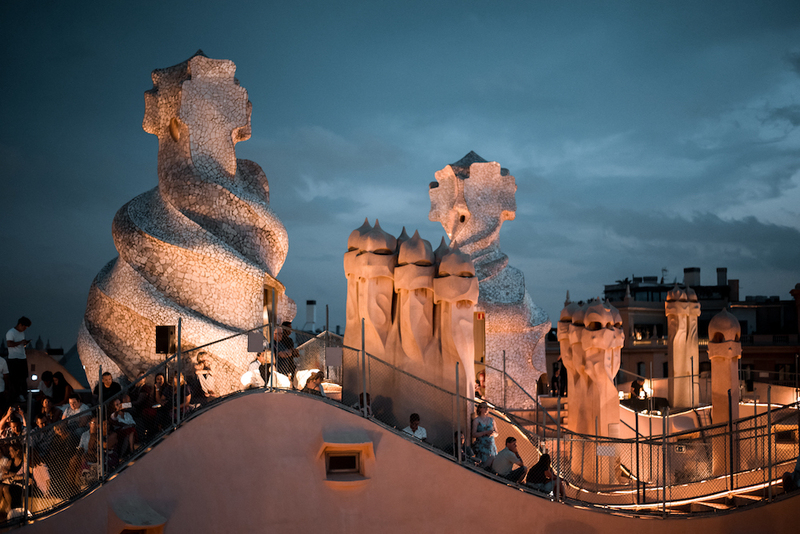 What: Live jazz concerts staged on the rooftop of Antoni Gaudi’s iconic La Pedrera (aka Casa Milà) building in Barcelona. 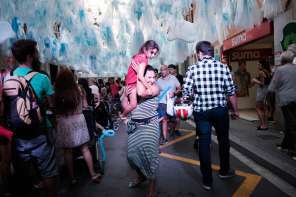 When: 8pm on Friday and Saturday nights, from early June to mid-September. 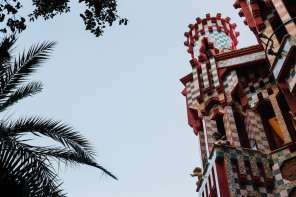 Price: €35 per person (includes a free glass of Catalan cava (like champagne) and entry to the Espai Gaudí museum in the attic). 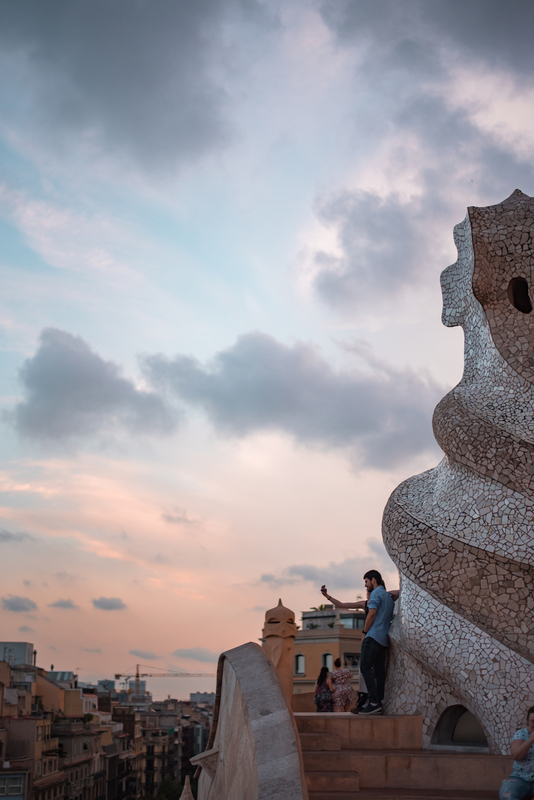 What better way to experience one of Barcelona’s most iconic buildings than with a live rooftop jazz concert at sunset. 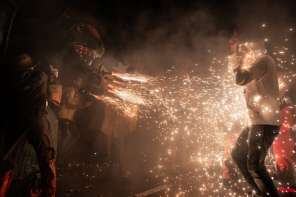 This is an experience I reserve for when I have guests visiting Barcelona and I want to impress them. 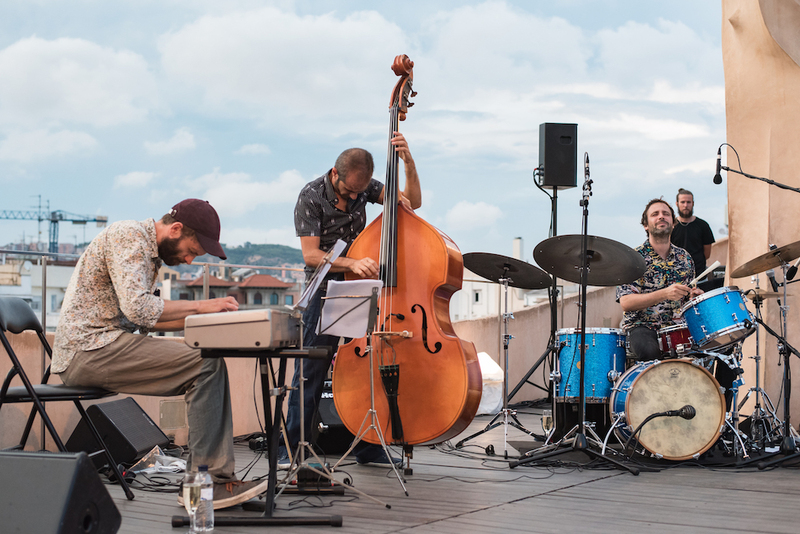 These intimate live jazz shows are among the most important cultural activities in Barcelona, attracting homegrown jazz acts and international musicians alike. 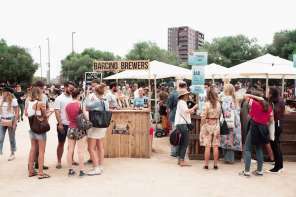 The alfresco stage is erected on a nightly basis throughout the summer months and has, unsurprisingly, become an important destination for European jazz music. 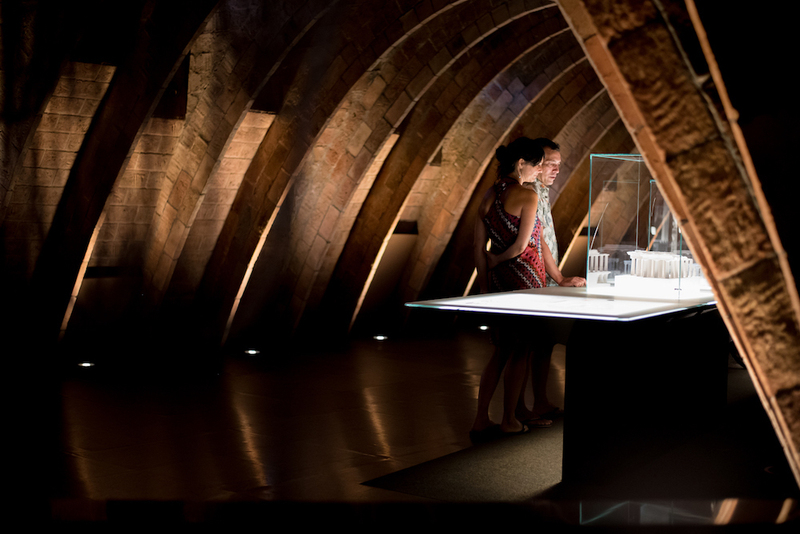 The jazz nights at La Pedrera start with a visit to the Espai Gaudí, which provides an overview of Antoni Gaudi’s work and an insight into his empirical approach to architecture. 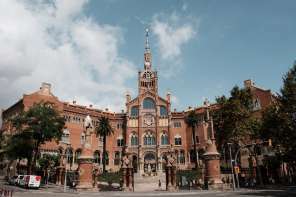 Located on the opulent boulevard of Passeig de Gràcia, the building itself is a true emblem of Barcelona and was built between 1906 and 1912. It was commissioned by the wealthy couple Pere Milà and Roser Segimon. The couple lived on one floor of the property and rented out the other apartments to the rich and famous of the time. La Pedrera (official name Casa Milà) was Antoni Gaudi’s last civil design project – before he focussed all of his time on La Sagrada Familia – and epitomises the architect’s sinuous style. Antoni Gaudi, or ‘The Modernist Master’ as he is often referred to as, was way ahead of his time, but this singular feat of architecture hasn’t always been loved and revered as it is today. 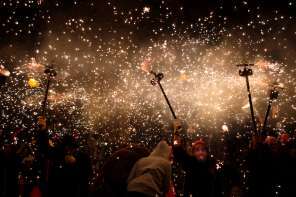 In fact, upon unveiling his masterpiece, Gaudi became the source of sensational and often stinging satire, with many journalists and members of the design community comparing it to a “stone quarry” (“La Pedrera” in Catalan). The nickname has stuck to this day. Now, of course, Casa Milà’s bizarre undulating stone facade and absence of straight lines is exactly what everyone admires about it. The building became a UNESCO World Heritage Site in 1984. It wasn’t just the aesthetic design elements that were progressive. Gaudi’s use of parabolic arches instead of load-bearing walls means much of the building is self-supporting. This allowed Gaudi to incorporate the ginormous gaping, sun-filled internal courtyards. And needless to say, the surreal rooftop space, which features a forest of avant-garde chimneys and seashell-inspired nooks and crannies, makes for a unique and ineffably romantic live music venue. 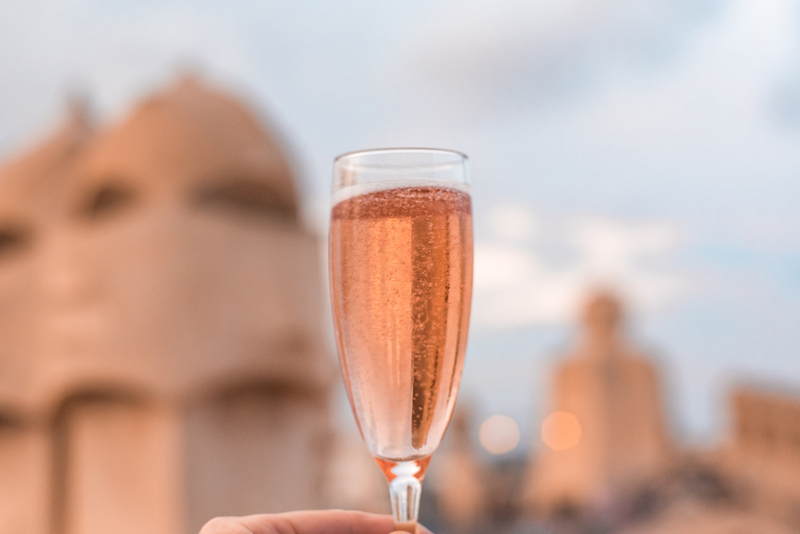 If you really want to make a night of it, the “Gaudí’s Pedrera: The Origins + dinner” experience is a feast of contemporary Iberian cuisine in true Modernisme-style. Available every night at the Cafe de la Pedrera on the ground floor, this is unquestionably one of the most idyllic dining spots in Barcelona. 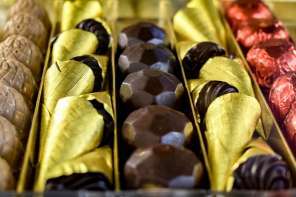 Tip: For the ultimate day of culture, I suggest taking Wanderbeak’s Gourmet Gaudi Food Tour, which is a fantastic way to explore Barcelona’s Modernist architecture and Michelin-starred dining. 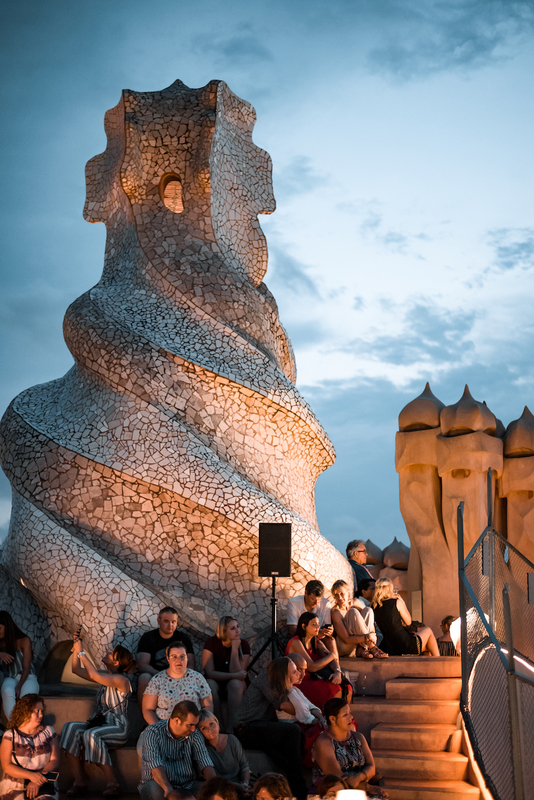 Take the tour during the day and follow with this rooftop jazz concert at Casa Milà. 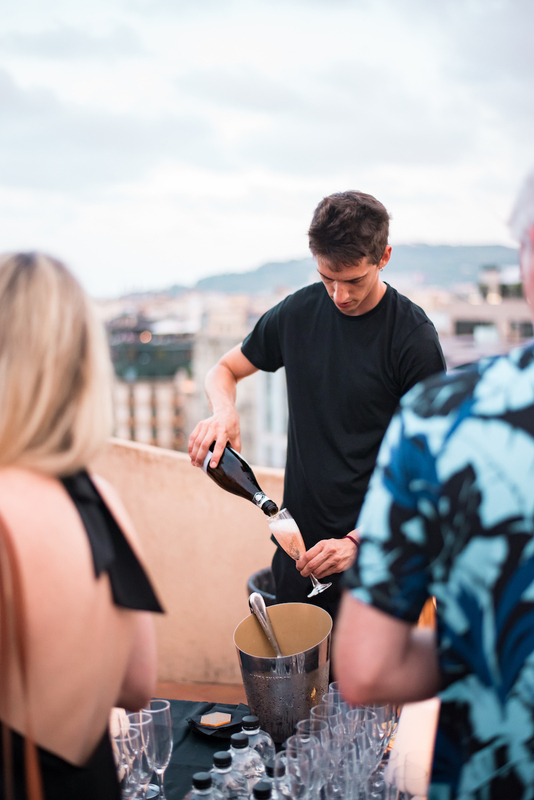 Whether you’re a verified jazz fiend or simply looking for the ultimate Gaudi experience in Barcelona, you’re sure to have a night to remember at La Pedrera’s Summer Jazz Nights concerts. Buy your tickets here (tickets are limited so be sure to book ahead of time). Tip: The jazz nights experience does not include access to the interior areas of the property, i.e. the famous apartments and patios. 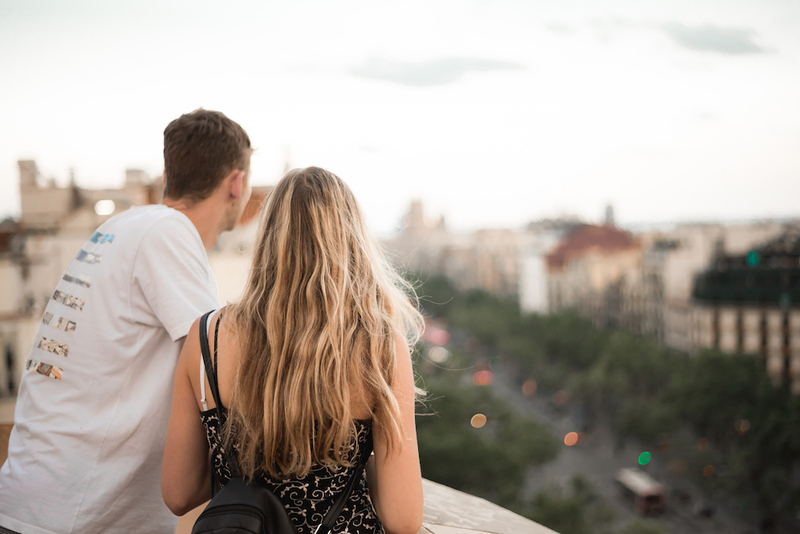 I would highly recommend seeing all of the property – be sure to get the skip-the-line La Pedrera ticket so you don’t spend half a day waiting to get it! 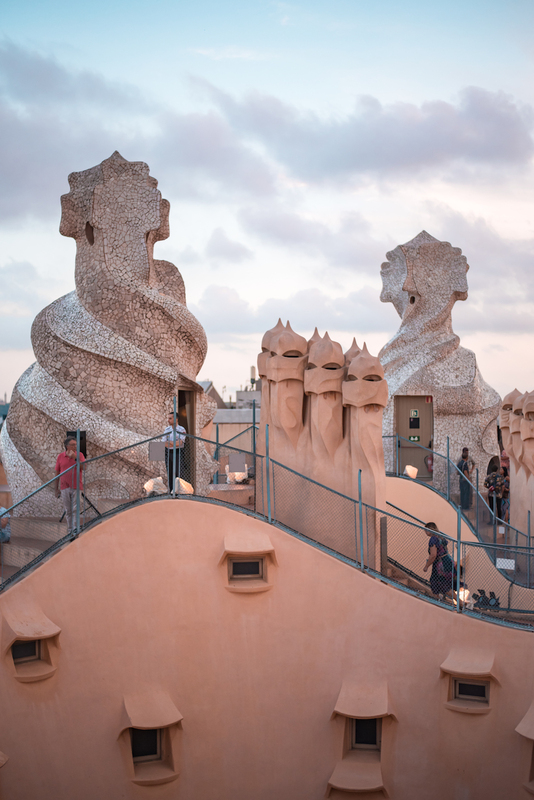 There’s no dress-code, but La Pedrera is a heritage building so it’s worth dressing appropriately – especially if you plan on dining somewhere nice before or after the show. 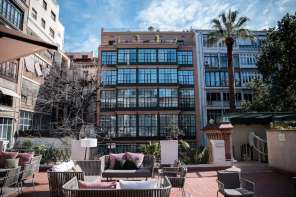 On first inspection it feels like Valencia, Spain’s third largest city, is a blend; a cocktail of classic Madrileño style with the palm-tree-aromas of Barcelona….